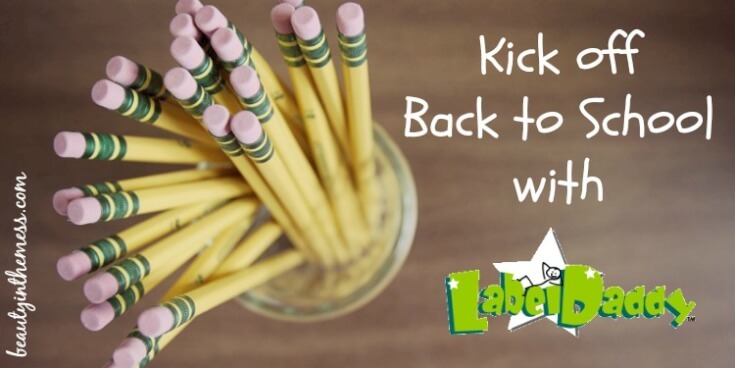 Kick Off Back to School with Label Daddy with your 20% off discount code! Label Daddy is the number one solution for labeling your belongings! Remember to label all clothing, sports equipment and other personal belongings your kids bring to school, camp, sports leagues, day care, and other places. Label Daddy labels keep them from getting lost or mixed up with others. These labels are super durable peel-and-stick washable labels — they’re washer/dryer safe, microwave safe, dishwasher safe and UV resistant! Label Daddy labels are also fun and attractive. You design your own labels! Pick from tons of colors, sizes and logos, including Disney and Marvel characters, MLB, NBA, and NHL team logos, other sport and fun logos, and more. Our exclusive laminated coating gives labels an extra layer of protection and is a must for camp! These labels are made in the USA and shipped directly to you worldwide. Label Daddy also carries Allergy Labels. This is HUGE. Gluten is evil in our house. While we haven’t had to deal with preschool, or daycare, we do bring our own snack to Sunday School. Just recently did they start providing stickers to go along with the name tag. These Allergy Labels from Label Daddy could have saved us from the times when the teachers had to seek me out to inform me that they had mistakenly given our oldest son gluten. My kids can not wait to get their Label Daddy labels. So far they have picked Sofia the First, Jake and the Neverland Pirates, and Mickey Mouse. You might say that we’re a little Disney obsessed at our house. Just for Back to School, Label Daddy has partnered with US Family Guide to provide you with a discount on your labels. Which labels are you most excited about?